Please submit any sales inquiries using the form below. If you are a current customer and you would like technical support then login to member area to submit a support ticket. The form below should only be used for sales inquiries because all support tickets are tracked to ensure that you receive our same day support guarantee. 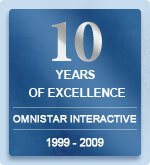 © Copyright 1999-2009 Omnistar Interactive, LLC.